Roger Goodell handed down the suspension of four Saints today for their involvement in the bounty program that initially led to multiple suspensions among the coaching staff and front office. 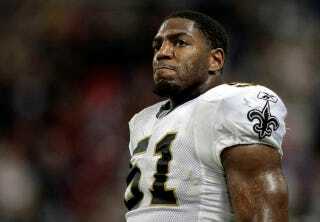 Most notably, linebacker Jonathan Vilma is out for the year, and defensive end Anthony Hargrove is gone for the first eight games of the 2012 season. As you might expect, several NFL players have started to voice their displeasure with Goodell's ruling. Here's a quick roundup of the initial reactions. And just a few minutes ago, the NFLPA released an official statement, condemning the suspensions. After seeing the NFL's decision letters, the NFLPA has still not received any detailed or specific evidence from the league of these specific players' involvement in an alleged pay-to-injure program. We have made it clear that punishment without evidence is not fair. We have spoken with our players and their representatives and we will vigorously protect and pursue all options on their behalf.